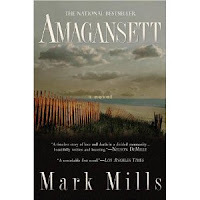 I don't recall whose blog reviewed Amagansett, but I'm almost positive that's where I got the recommendation: a fellow blogger. And a good recommendation it was. I actually finished the book Monday night, late, when I couldn't sleep, but it's taken me a few days to get motivated to write a review (and not because the book wasn't good). After I heard about it, I bought it at Barnes and Noble, then it sat on my shelf for over a year. It's a murder mystery, but also a picture of the vast divide between the haves and have-nots in Montauk, Long Island. Conrad Labarde, a Basque fisherman, hauls in the dead body of a woman, which starts turning the wheels of the investigation into her death. What, if anything, is Labarde's connection to the woman? Who killed her? Why? Finding out the answers to the mystery started to take second place, however, to the mystery that was Conrad Labarde. This book had a lot of similarities to the last book I read, The Disappearance. Both novels featured a crime as the central impetus. Both novels were set in the Northeast. Both novels featured a fairly compled male lead character. However, of the two, I preferred this one. It was simply better-written and more fully developed the characters. The mystery was done better, too. I'm finding it hard to write about this book, for some reason. But I really, really liked it. I'll give it four and a half out of five Whatevers. For those who like a really well-crafted mystery or who love the Northeast.